You know you are on the right road for the Isle of Grain when you see the signposts saying "industrial area" and "power stations". You keep on going across the flats, through Grain, and take the footpath at the end of the village across rough fields against the backdrop of the power station. Turn north and you can walk along the side of the estuary towards Yantlet Creek, catching the container ships on their way to the docks on the Isle of Sheppey to the east. It is pretty austere. Dry grasses grow through the cracks in the concrete. The railings are rusty. A few fishermen stand stoically around. We got talking to an elderly couple sitting on a wall and they told us of a man they met who had come over from the other side of the estuary because he used to look across and wonder what it was like. They liked it here. 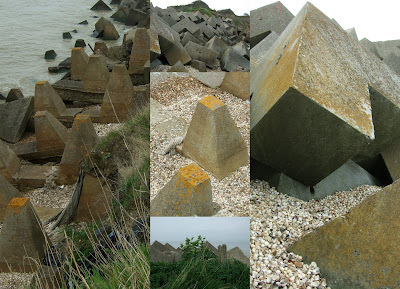 As you reach the end of the esplanade, beyond Cockleshell Beach, curiously shaped blocks stand on the foreshore to stop the sea and other invaders coming in and eroding the fragile low lying cliffs. It's like a man made Giant's Causeway of sorts. 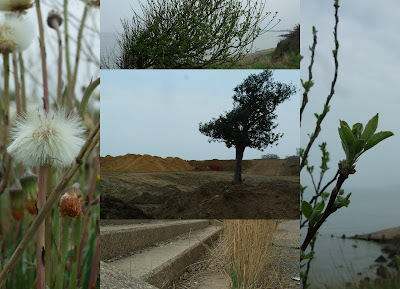 On the cliffs and the scoured land behind them the vegetation has the appearance of holding on for dear life - a wind battered apple tree on the cliff edge, a single holly tree in the middle of a giant sandy moonscaped pit and seedy coltsfoot. 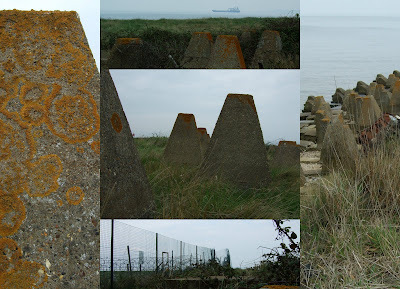 Then at the end, more standing stones, mimicking ancient druidic relics, covered in lichen and curving brambles, mirroring the barbed wire fences to keep people out of the firing range. Other wordly, less than an hour from home. 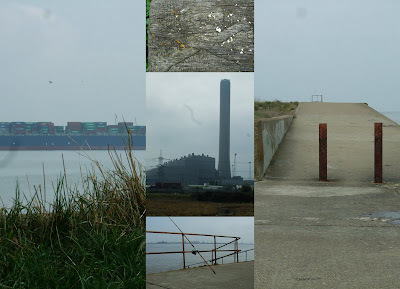 I went to the Isle of Grain a couple of years ago out of curiosity. I think we were going to Digger Land or somewhere. An amazing place - I may be completely wrong, but didn't Queen Victoria used to sail from the Isle of Grain? I just checked the Queen Victoria connection on Wikipaedia and you are right. It says "Bignell records that: she "... took a rather curious fancy to Grain as a chosen departure point for trips to Germany""
Grain seems to have rather an unusual capacity for inciting curiosity it seems. i love these kinds of landscapes, thanks for posting this. am reading ackroyd's Thames, which is less interesting than this post.